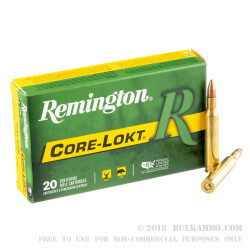 Remington's Core-Lokt ammunition uses an older, proven method for absolute weight retention that will bring down most medium-sized game animals in North America with ease. The Core-Lokt name refers to the toothed cannelure which binds the 100-grain PSP's (Point Soft-Point's) copper jacket to its dense lead core. 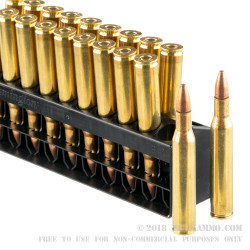 When the naked point of the round strikes a target it produces wide, mushrooming expansion with no fragmentation; this results in appropriate penetration depth that will reach vital areas behind the upper ribcage of a deer, hog, or small bear. The resultant deformed round will tumble as it creates a very large wound cavity and deposits all of its energy in the game target with little chance of lethal overpenetration. 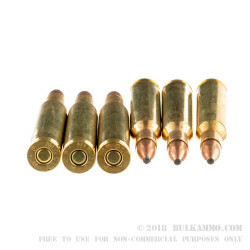 These .270 Winchester cartridges utilize reloadable brass casings that can be cleaned and customized by experienced handloaders. Each case bears a non-corrosive Boxer primer at its base that won't leave behind abrasive, metal-eating chemicals. The primer lends a spark to clean-burning powder that has been formulated specifically for this load. 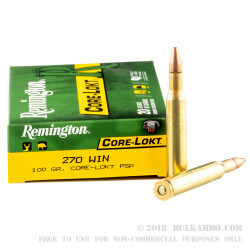 Remington has been around for over 200 years and is one of the strongest names in the shooting industry. Their Core-Lokt format has a reputation for righteous performance and inexpensive accessibility that is over seven decades strong.